As I’ve been informed ad infinitum via the media, there are of course many good, patriotic muslims in this country. Though as far as I know, I’ve yet to meet any muslims, good or bad. What I do know is that there exists a large and vocal radicalized, extremist Islamist sect bent on violence and the destruction (or capitulation to Allah) of America and much of the western world. Here in the United States, the Islamofascists cannot simply take over the White House and turn the country into a theocracy as they (and many moderate muslims as well) would prefer. Instead, some utilize less overt methods in which to weaken our country. Referring to the Imam debacle on US Airlines flight 300, the following editorial expands upon what I initially suspected: the Imam’s in question are slimey bastards who simply want to undermine our security. 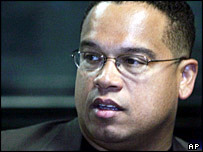 What’s even more interesting is their ties to newly elected Representative Kieth Ellison, D-Minn.
Islam And Politics: As we first suspected, the six imams bounced from a US Airways flight misled the public about the incident and likely staged the whole thing as a scheme to weaken security. Their actions undermine any good will and trust Muslim leaders have built since 9/11. And they call into question what we really know about these supposedly virtuous men we invite to the White House and other halls of power in gestures of tolerance. Are they really moderate? Do they really mean it when they renounce terrorism? Do they really have America’s best interests at heart? The police report detailing the US Airways flap gives us serious pause. The imams acted more like provocateurs than victims. At the gate before boarding, they angrily cursed the U.S. Then they bowed to Mecca and prayed “very loud,” chanting “Allah, Allah, Allah,” according to the gate agent and another witness. On the plane, they didn’t take their assigned seats and instead fanned out to the front, middle and rear of the plane. One even “pretended to be blind” to gain access to another passenger’s seat, according to a flight attendant. Some ran back and forth speaking to each other in Arabic. Adding to suspicions, most of them asked for seat belt extensions even though they didn’t need them — or even use them. Yet the ringleader, Omar Shahin, claimed before the police report was released that they “did nothing” unusual. “It’s obvious discrimination,” he insisted. When the story first broke, the imams denied they chanted “Allah.” Yet, several witnesses in the police report say they did. The imams also claimed they were handcuffed and harassed by dogs. “Six imams. Six leaders in this country,” Shahin complained. “Six scholars in handcuffs.” But the police report puts the lie to both those claims, too. Shahin also claimed that a local FBI agent pleaded with US Airways to sell the Saintly Six imams another plane ticket, telling airline reps that the government had “no problem” with the men. “Never happened,” says an FBI spokesman in Minneapolis. Shahin and his fellow imams, who were educated in Sudan and Saudi Arabia, says he and the imams are all moderates who love the U.S. and denounce terror. He doubts Muslims were responsible for 9/11. But Shahin engages in more dissembling. He leaves out a key part of the verse (5:32) that condones killing those who murder fellow Muslims or spread “mischief in the land.” Mischief is defined as “treason against Allah,” and the very next verse calls for guilty infidels to be beheaded. Shahin himself has ties to terrorism. He served (unknowingly, he now says) as an agent and fundraiser for a Hamas front. He ran a mosque in Tucson, Ariz., attended by several al-Qaida operatives including the hijacker who flew the plane into the Pentagon. And he now runs an imam federation that counts an unindicted co-conspirator in the 1993 World Trade Center bombing among its trustees. Shahin also teaches at an Islamic school fully accredited by an Egyptian university tied to the dangerous Muslim Brotherhood. The school’s founder preaches sharia law. One of the imams kicked off the US Airways flight, an Egyptian native, praised sharia law, according to a passenger who sat next to him. But most disturbing, these imams aren’t the fringe. Shahin’s group, the North American Imams Federation, represents more than 150 mosque leaders across the country. It works in concert with the Council on American-Islamic Relations, which wasted no time slamming US Airways for “stereotyping” Muslims and calling on Congress to pass legislation to outlaw passenger profiling. Both CAIR and NAIF work closely with Rep.-elect Keith Ellison, D-Minn., the first Muslim member of Congress. Conveniently enough, he immediately stepped in on their behalf to pressure US Airways and the local airport to change security policies. If it were an orchestrated stunt to create public sympathy and force airports to look the other way when groups of Muslim men fly, it’s working. The Minneapolis airport plans to add a prayer room for Muslims, and Democrats plan to hold hearings on Muslim profiling. This could have a chilling effect on efforts to investigate terror suspects in the Muslim community. Such hearings would only confer legitimacy on bogus complaints by Muslim leaders. We need to take a harder look at them, not airlines’ security policies.